Extended closing opportunity to allow buyer to establish tenants for units. 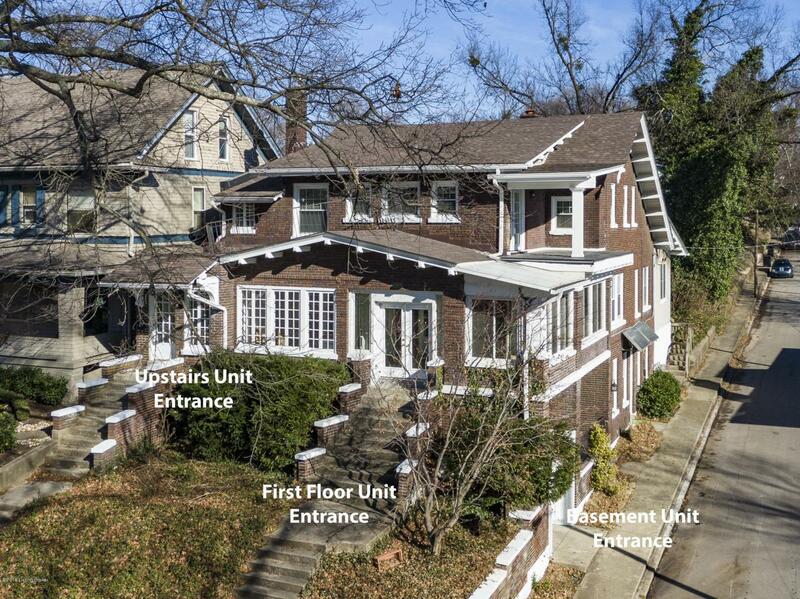 The Highlands brick triplex, Tyler Park location, . Three deeded units all with Craftsman entrances and outdoor porches and one with large private garden. Bright and Sunny throughout. UPDATED, move-in condition. Lease all three or easy owner occupy. Spacious eat-in kitchens, large closets, dining and family rooms. Natural Hardwood floors, new luxury vinyl in kitchens, newer windows and updated mechanicalS. Community space includes Storage area and areas for three washers and dryers, all are metered, separate water heaters and separate HVAC. There is a back-interior staircase for easy entrance to all units. All rooms (exclude kitchens) have ceiling fans with designer light kits . Most windows faux binds.Unit 2; 2,482sqft 3 bedrooms 2 full baths. Character and Charm. Front entrance from Tyler Park on the second floor. This unit goes from the front of the building to the back and includes a private patio and garden, perfect for bikes and expanded out door space. Wonderful Park Views, wrap around front glass sun porch over 617sqft with Art Deco tile, epoxy floors and arched doorway. Big family room high ceilings, skylight and built-ins. Living room includes Electric fireplace, dining room, living room and Master Bedroom with en-suite bath has a jetted tub, ceramic stone bath, large walk-in closet and bonus private office with guest loft or kool kids space, kitchen with full pantry. Eat-in kitchen with granite stone tops, wall-to-wall cabinetry. Updated second bathroom with shower tub insert, bedroom 2 with closet. Bedroom 3 connects to full bath. Garden has a private entrance from Edgeland Avenue. Unit 1; 1,200 sqft. 1-2 bedrooms, one bath. Perfect to share. Main level with two entrances on Edgeland; one open front porch exposed brick in family room and bedroom, bath with private shower and lavatory room, ceramic tile, tall ceilings, nice windows, decorative fireplace. This unit is in the walk out portion of the building so lives like first floor. Unit 3; 1,766sqft Inviting park entry. 3bd, 1 bath, third floor walk-up Park main entrance, big railed side porch overlooking the park. Lovely entry with character and charm. Nice bedroom closets, 1 full bath with ceramic stone, dining room and living room, updated eat-in kitchen and granite look a-like tops and full pantry closet. Extra walk-in closet in hallway. Noted seller suggests additional window ac for 3rd floor bedrooms.